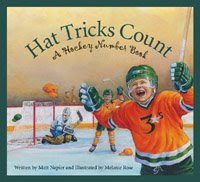 Following their successful 2002 release Z is for Zamboni: A Hockey Alphabet, author Mark Napier and illustrator Melanie Rose returned in 2005 wtih Hat Tricks Count: A Hockey Number Book. While Zamboni looked at the alphabet, Hat Trick looks at the numbers 1 through 12, 15, 20, 21, 25, 30, 40, 50, 60, 70, 80, 90 and 100, with 99, obviously, also getting special mention. I am not quite sure for the reasoning behind picking the particular numbers that they did, but regardless it all adds up to 1 great book. Like Zamboni, this book's primary focus does not appear to be teaching numbers so much as hockey. The numbers are understated in comparison to Melanie Rose's continued great art work. Most of Napier's sidebar text, which is often historical in nature, has more to do with hockey than numbers. Still, I see this is another solid offering from Napier, Rose and Sleeping Bear Press. A parent and a child can enjoy this book together. Perhaps they will enjoy it on different levels, but I am happy to support any book that gets parents and kids sharing time together as well sharing a love of, books, learning and hockey.